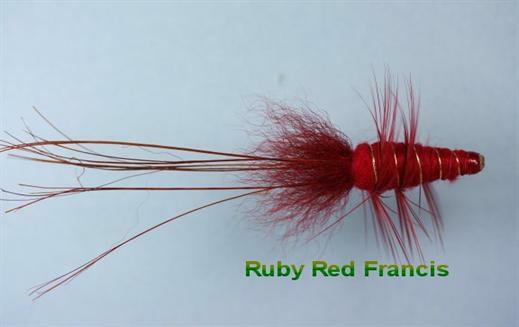 The Ruby Red Francis resembles a shrimp, and can be an extremely lethal fly when fishing for Salmon. It is a very popular pattern for use in heavy water. It often works best in autumn, and is very effective with Atlantic salmon when fished across using short, twitching pulls, especially when fishing low waters. Currently there are no comments about the Ruby Red Francis fly pattern from other fly fishermen yet.